The story of my road to MS and my eventual ability to live a happy and fulfilling life with the disease has not been an easy one. There have been a lot of bumps along the way, and there have been both good times and bad. I feel that it is like this for any patient battling the disease. While my story is now a very happy one, it is important to know that there was a fight to make it to this point, and that if you are willing to work at it, you can be here, too. Are you or someone you love and care for living with Multiple Sclerosis (MS)? MS can be a devastating disease that can turn everything in your life upside down. For many people the struggle to discover a happier, healthier way to live with the disease can seem like an impossible task. It is important for you and others with MS to realize is that it is possible. It is my hope that my story and book on living with Multiple Sclerosis will offer you inspiration and remind you that there are others out there battling this disease and winning. 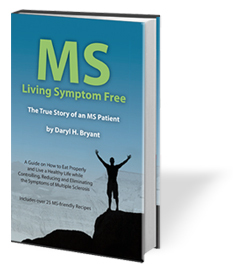 No two cases of MS are exactly alike, but I hope you can use my story, my symptoms, and my successes to help you make the changes you need to achieve better health. It can be done; you can live a healthier and happier life with MS.